F Alex Johnson wins Independent Music Award. 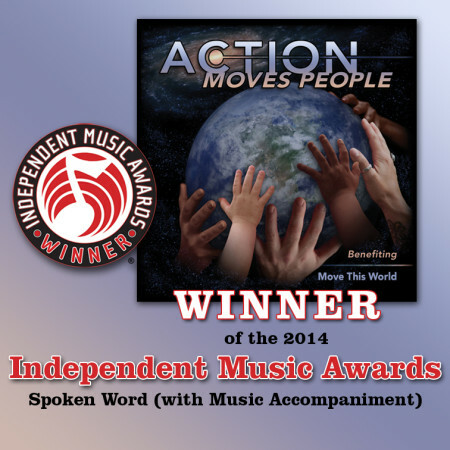 In the spring of 2014 F. Alex Johnson won an Independent Music Award for his contribution to the album Action Moves People–a compilation of spoken word with music accompaniment benefitting Move This World. MTW is a global non-profit that uses creative movement to address and transform conflict and violence in communities. The lead-off track to the album is titled “The Human Race” featuring the words of Karelleyn Brae Wade with original music by Alex who also provides the spoken word. Listen to the track below. Or check out the whole album here. The album was produced by Kevin Mackie, Krista Wallhagen, Whitney Peyton, Rave Tesar, Kevin Frank and Bobby Susser and is available through iTunes, Amazon and CD Baby.